Did I mention I love ethnic food? Specifically Thai food? Unfortunately, a lot of that Thai food does not get along with my healthy-eating goals. Enter this little recipe. 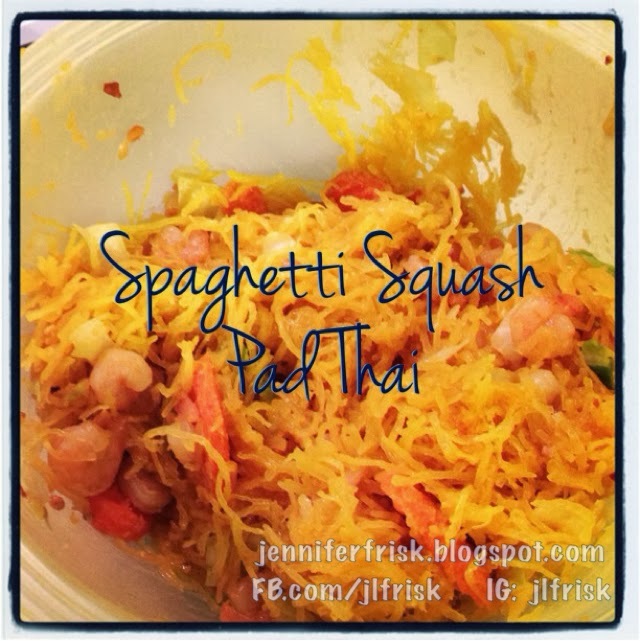 Spaghetti squash Pad Thai....all the heartiness of the original without all the unnecessary "junk." Microwave squash for 1-2 minutes, then cut in half lengthwise. Microwave, cut side down in approximately 1/2 inch of water for 7-8 minutes, or until soft. Shred squash with a fork. Saute garlic for one minute. Add the cabbage and carrots, and sauté over medium high heat for 3 minutes. Remove veggies to a plate. Add broth, peanut butter, soy sauce, rice vinegar, and pepper flakes to skillet. Heat until smooth. Return all ingredients, including chicken, to pan and cook 5 minutes or until sauce has covered all. Oh, and I got my 21 Day Fix yesterday! Looks like it will take a bit more planning than anticipated (didn't realize how few veggies I actually ate!) so the start date is Sunday. Here we go! !